When asked to draw on his decades of experience and offer insight into the alchemy of squad building, Ballymena United boss David Jeffrey offers up an answer rooted more in the mundane than magic. Significant summer work in the transfer market has left Jeffrey with a panel of players unbeaten heading into tonight’s Mourneview Park visit. However, the most experienced top-flight manager in the Irish League considers planning and patience key to the delicate balancing act over any suggestion of accrued special knowledge. “We are not getting carried away but it would be silly not to say we are pleased with how the season has started,” said Jeffrey. “You never necessarily enjoy the process of transfers but it is a welcome challenge. “You look at players you want to bring in that suit your style of play, young men with the right character to come to the club and understand no-one is assured of a place. “You want good people who are good players, with the right work ethic and determined to prove something. “You trust in your homework and after that is is simply down to hard work on all fronts. “There is no such thing as a substitute for that basic principle. 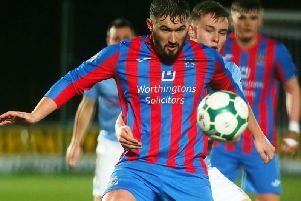 Glenavon manager Gary Hamilton wants some home comfort following back-to-back away-day delight in the Danske Bank Premiership. Friday’s victory on the road at Newry Showgrounds marked a second successive success away from home by the Lurgan Blues, following the previous weekend’s win over Warrenpoint Town. Now Glenavon play host to Ballymena with the only blemish from the opening three league battles the home defeat on the first day of the campaign to Linfield. It is an imbalance Hamilton is keen to address - bolstered by the growing resolve he considers key to the wins at Warrenpoint and Newry. “Good teams get points even when not playing well and that was the case against Newry,” said Hamilton. “I felt we did not get what we deserved from the loss to Linfield so maybe it turned out the other way last Friday. “But I was impressed with the spirit on show and that determination to get a result despite not producing the standard of football we wanted. “You take someone like Steven Donnelly, he is honest enough to accept Friday was not his best performance but came away with a good goal and that is pleasing from his viewpoint as both a striker and recent signing. “Gary Muir stepped in as part of our reshuffled defence due to Andrew Doyle’s injury in the warm-up and was brilliant, especially after having played a full game for the reserves on Wednesday. The challenges continue as Jeffrey’s unbeaten Ballymena United arrive in Lurgan aiming to maintain positive early-season momentum.